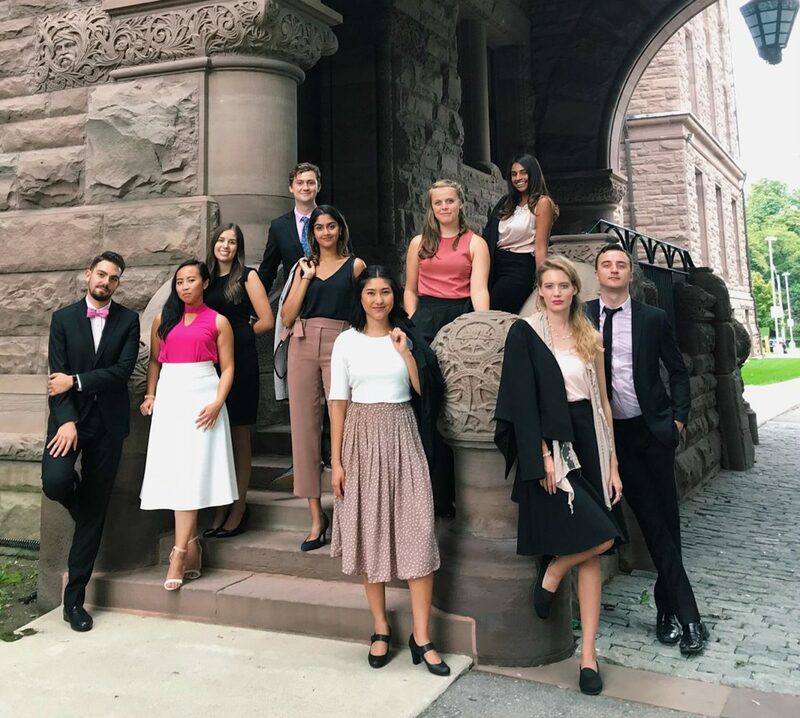 The interns filed onto the subway to make a long trip out to Scarborough to the headquarters of Elections Ontario to meet with Chief Electoral Officer Greg Essensa. Ontario’s Election HQ is a nondescript large warehouse and single-story office building in an industrial park, and we admit to being deceived by the plain and quiet outside: when we entered the building, we were surprised to see a bustling and futuristic workplace – and that was only the first of the surprises that awaited us! CEO Essensa welcomed us with a brief overview of his own extensive career in elections (he has been CEO for over nine years, since 2008, and before that was Director of Elections for Toronto for 7 years). He spoke at length about the work of Elections Ontario, and in particular their efforts to improve the accessibility of voting and respond to the challenges of modern elections. Technology presents unique challenges for elections; while it offers increased ease of voting, options such as online voting are complicated by vulnerability to tampering. He reminded us that as an Independent Officer of the Legislative Assembly, and as steward of Ontario’s elections, his duty to Ontarians is to guarantee scrupulously accurate and reliable counts that exactly reflect the votes cast. Since he is responsible for Ontarian’s trust in the democratic process, CEO Essensa must remain entirely neutral; meaning the man who cares most about getting Ontarians out to vote cannot himself vote in provincial or municipal elections. For the present, he advocates Ontario maintain paper ballots for accountability and reliability. The ballots which voters cast, however, are only one area in which Elections Ontario can modernize. CEO Essensa explained the increasing difficulty of recruiting poll staff, the rising incidence of poll worker error, and the inefficiencies in poll station operation. These are the areas that Elections Ontario has targeted for improvement, changing the set-up and organization of polls to require far less staff, speed up voting, and support voters who need extra assistance registering. He also introduced us to new tabulating machines to count ballots, and new initiatives to improve voter turnout. It was then that he gave us the biggest surprise of the visit: a tour of Elections Ontario HQ, including the massive warehouse filled with flats that include of all of the materials every single constituency returning officer in Ontario will need for the election, from computers, to ballots, to toilet paper! We were excited to see the locked area where the 7-9 million ballots from the last election are kept, and shocked to see that it was smaller than most of our MPP’s offices (and had lots of room to spare!). We finished by examining maps of constituencies and poll divisions, and seeing how Elections Ontario creates elaborate profiles of stereotypical voters to plan their outreach efforts in a more personal way. Hearing about how Elections Ontario works with community organizations to ensure all voters have access to service in their native language – a gargantuan task – was particularly awe-inspiring. CEO Essensa finished with an invitation to us to consider working for Elections Ontario in the future, and expressed his support for the program. It is our turn to thank him warmly for his hospitality and generous gift of his time and experience. We wish him and Elections Ontario all the best as they accelerate towards the 2018 General Election! During our time in Yellowknife, we had the privilege of meeting with the Deputy Law Clerk, Alyssa Holland at the Legislative Assembly of the Northwest Territories (NWT). When the house is not in session, Alyssa also works as a litigation lawyer in Lawson Lundell’s Yellowknife office with a broad civil litigation practice, focused on administrative and public law. She represents a range of individual, corporate and government clients across the Northwest Territories and Nunavut. Prior to joining Lawson Lundell LLP, Alyssa served as a judicial law clerk at the Supreme Court of Canada and the Federal Court of Appeal. In this capacity, Alyssa worked on complex legal issues of national importance in areas including constitutional law, Aboriginal law, administrative law and commercial law, as well as issues arising under the Charter of Rights and Freedoms. We were pleased to meet with Alyssa to learn more about her career trajectory and discuss the unique style of consensus government in the NWT. We learned that private member bills get farther in this style of governance compared to other legislatures, and how she evaluates legislation to ensure it mirrors the drafting of the bills. Alyssa also spoke to us about the legal challenges facing the NWT: the lack of lawyers in the area of family law, serving distinct communities and low income population, and the difficulty of connecting people with services. Thank you Alyssa for this very informative and insightful meeting! We wish you the best of luck in your time at the NWT and hope our paths cross each other one day as some of us progress our careers in the area of public law.